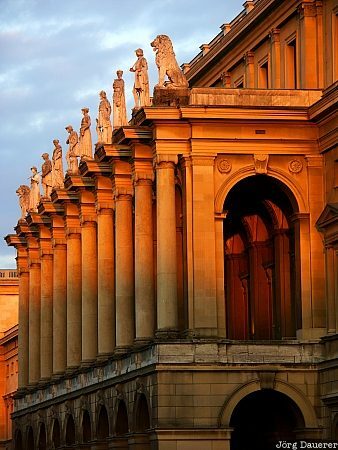 The statues and columns on the Residenz (the former home of the Bavarian Kings) in downtown Munich illuminated by the last light of the day. Munich is the capital of the state of Bavaria in southern Germany. This photo was taken in the evening of a sunny day in May 2004. This photo was the image of the month in April of 2010. This photo was taken with a digital camera.